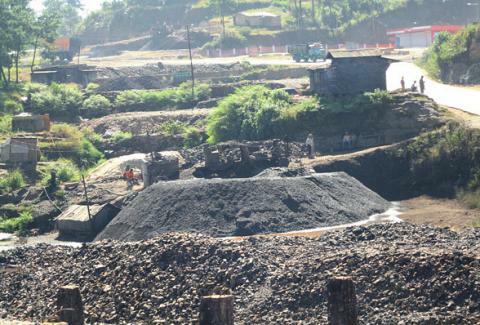 Rat-Hole in Meghalaya: Whose coal is it anyways? The blanket ban on ‘rat-hole’ mining in Meghalaya, a procedure of coal mining, unique to the state have sparked off a raging debate in the tiny hilly state on the land use policy, in the far north eastern corner of the country. The primitive and unscientific mode of mining was banned by the National Green Tribunal (NGT) on complaints by some organisations that rampant mining is turning the water of nearby rivulets and water streams acidic which are the major source of drinking water in the area. Meghalaya being a tribal state, the community owns the land, which means the rights of the land use are entirely with the clan or villagers which resides in a specific area and the state has a very little authority over the land use pattern. For instance other than illegal coal mining, Jhum cultivation also known as shifting cultivation, a farming technique wherein large tracts of hilly forest land are cleared to cultivate till the soil is fertile no more is still being practised in the state, leading to large scale deforestation and its impact on ecological balance is alarming to say the least. For decades tribal hilly communities in large part of the north eastern region are following such ancient methods for their livelihood and government intervention on such matters of environmental degredation was pushed under the carpet on the pretext of land ownership rights. On the issue of rat-hole mining, coal mines which are mainly concentrated in the Jaintia Hills district of the state are termed as small-scale mines which operate beyond the purview of the Coal Mines (Nationaalisation) Act. For some time mow there has been talk to regulate the sector as several miners have lost their lives. NHRC also has taken suo-motu cognizance of the issue as the mine owners employed large number of children who migrated from places like Nepal, Bangladesh. Tata Institute of Social Science has also done a study on the children engaged in the hazardous rat-hole mining. In fact, business from this small-scale mines controlled by individuals runs into millions per day. According to an estimate, on an average a coal mine owner earns anything between Rs.100-200 crore per annum. According to a study, undertaken to analyse the process of human induced landscape transformation in the coal mined affected areas of Jaintia Hills district of Meghalaya, northeast India by interpreting aerial remote sensing data using geographic information system. The study revealed that most of the areas were dominated by grassland/non-forest in all the time sequence period of the study. The area under forest cover had decreased about 12.5% and there was about three-fold increase in mining area since 1975 to 2007. From time to time various studies on the ecological impact of the rat-hole mining pointed towards gross disregard for the environment, however, mine owners some of whom have become business barons in the state operated with political impunity. They have violated all the laid norms, employed and exploited migrant laborers and pushed them into the dark mines without any safety measures. More than thousand mine workers have fallen prey to the accidents in these mines but, state and central agencies have turned nelson eye to these issues. On the public outcry, Meghalaya government passed a new mining policy in the state in the year 2012 however, the same policy asserted that small and traditional system of mining by local people in their own land shall not be unnecessarily disturbed. Notably, the NGT in its order observed that except for coal mafias, neither the government nor the people were benefiting from such “illegal mining” of coal. For want of a better solution, lives are being jeopardized and environment destroyed, all in these rat-hole mines. In that sense, the ban by NGT is much welcome.